Wish you knew where your friends and family were at all times? Have you heard of Loopt yet? Loopt is a mobile phone application that enables users to spy on see the location of their friends on an interactive map (see image below). The application also allows you to message friends in your general area and setup automatic alerts to notify you when friends are nearby. In the last few months, Loopt has published several BlackBerry versions of its software for all major American cellphone carriers including T-Mobile, AT&T, Alltel and Sprint. 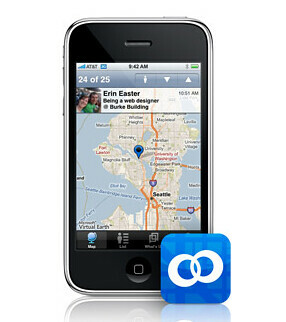 Loopt also demonstrated an Alpha version of their software for the 3G iPhone at the 2008 World Wide Developers Conference (WWDC). You can sign up to be notified when the full iPhone version of Loopt is released here. If you have a Jailbroken iPhone, then the function and features of Loopt might sound similar to Twinkle. Twinkle is a native Twitter client for the iPhone that pairs your GPS location with your Twitter posts. Twinkle also gives you the ability to add images to your Twitter Tweets. But whether or not you use Loopt, Twinkle or Twitter.. it’s not any fun unless all your friends are also using the service.